Using the best RV water hose in our recreational vehicle is one of the best ways of enjoying the ride! If you love camping just as much as the most of us do and you want to find the best hose for your RV, we’re sure that by now you’re feeling a bit overwhelmed with the plenty of selection when it comes to RV hoses for drinking. We understand how you’re feeling, friend, as we had been in the same situation before. If you want to ensure that you’re buying the right RV hose, we are here to help! We have written the most important factors to consider, including the price, length, type and diameter of the hose, among other things. In this guide, we’re also featuring our top 12 recommendations for the best RV hoses specifically designed and created for outdoor activities. They’re not our ordinary garden hoses, so make sure to read until the end of this guide to discover more about the high quality RV water hoses. For us, this is the best RV drinking water hose for its safe and high quality materials. This hose is made with 100% lead-free and BPA-free materials, which make it the ideal choice when it comes to safe drinking water. When we’re camping, we understand and recognize our need for safe drinking water all the time. That is why we love this product, which materials are certified and approved by the government. It also has a great inner diameter of 5/8″, which can deal with high water pressure. None of us would like to take the hassle of spending so much time filling our tanks. With this one, we can cut the time we have to do it because of its good diameter. This item is also made with reinforced design to guarantee kink resistance. 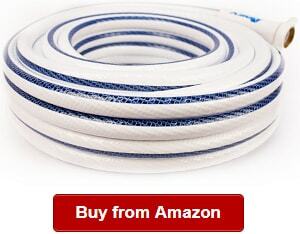 We love this feature because it can ensure the longer lifespan of our RV hose. We also know that none of us would like to deal with twisting or scuffing, and this one won’t give us a headache. When choosing a new RV hose, we also have to make sure that water won’t taste like plastic or chemical. It should not also have any rubbery taste on it, and that’s another thing we love about this Camco hose. This RV hose is also long enough to ensure that it can reach places in the camping ground especially if we’re unsure on how far the RV is to the water supply. 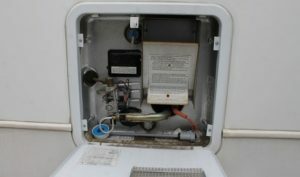 So without straining it, we can make sure that we can connect our RV to the drinking water supply easily. One problem though is that the hose can be stiff during first uses. Camping without clean drinking water is a problem. That is why we’re recommending a great product like this Camco water hose. For one, Camco is an excellent brand known by RV campers in the world for its reliability and dedication in coming up with portable, quality and affordable products many of us can rely on. We love this product because it is phthalate-, BPA- and lead-free, which means safety for our families. It is safe and ideal to use for recreational vehicles especially that we want nothing but clean drinking water when camping. Our team also loves it because it leaves no plastic or chemical taste in our drinking water. Another worth-noting benefit to get from it is that it is compliant with state and federal lead level laws, ensuring that it is a standard product that keeps up with safety levels of this chemical for our health. It also comes with machined fittings that add to its durability. When buying a water hose, it is something that we can all appreciate. 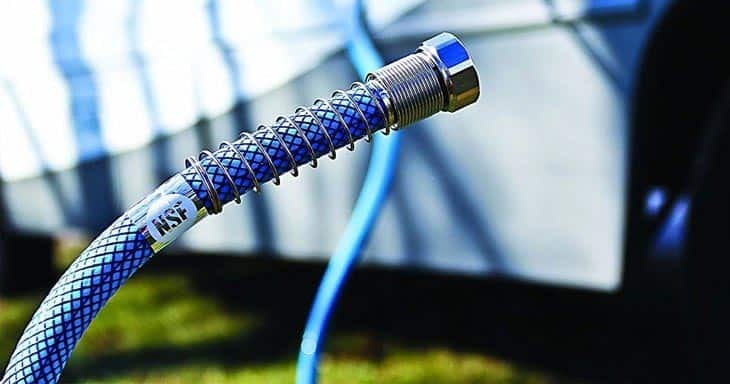 Speaking of long lasting service, the RV water hose is UV stabilized, making it even more durable, not to mention it is NSF-certified, another standard mark for our peace of mind. One problem though is that the water hose might suffer coiling out. 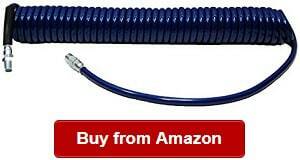 This is a flexible drinking water hose that is ideal for camper and boat. We recommend it because it is durable and high quality. It measures 5/8-Inch inside for good water flow, ensuring we can fill in our drinking water tank quicker than with any other products in the same category. Our team also loves that this is an extra long, 50 feet hose that is very flexible to reach places. This is something useful especially if we have to hookup our RV in a not so near location to the water supply in the camping ground. This product is also guaranteed not to tangle or kink, ensuring convenience and comfort all the time. There is no wonder because the brand is committed to producing hoses, which are easy to control. In this manner, we don’t have to deal with twisting and kinks whenever using it. We also like that this hose has this reinforcement network, preventing twists, kinks and tangles all the time. The brand, Teknor Apex, is also a US manufacturer known through the years for providing patented and quality products. One is the non-torsion system technology used in this product. You can notice this with the strip running its length. It is what solves kinking, a common problem among other RV water hoses. 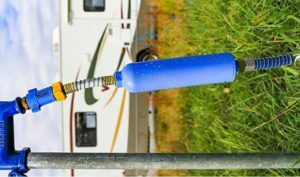 Our team also believes that it is one of the most durable RV water hoses around because it is safe for drinking water. This item is lead-free, complying with consumer safety standards. This item can ensure that water won’t also taste like plastic or chemicals, as it is also compliant with the Consumer Product Safety Improvement Act. We believe that the reinforcement network is also great because it adds to convenient use of this product. Plus, we find the antimicrobial protection even more useful because it protects the product from mildew and mold. One problem is that it is slightly heavy to give some users a problem in maneuvering it around. The Valterra W01-5048 is one of the best water hoses for drinking we found. For this reason, we find it useful to include in this review. It is a dependable item that we love to use because it gives us a hassle-free use all the time. The hose does not kink, twist or tangle whenever it is used. With that said, RVer’s like us don’t have to stress about our hose but simply enjoy our camping once we have set it up in our RV freshwater system. It has a great 1/2″ x 4′ size for a utility hose, and it does not end there. We also recommend this product because it has a gripper included. That said we don’t need to buy it separately. We also love the W01-5048 because it is non-toxic and safe to use in our RV drinking water system. With that, we don’t have to worry about our loved ones’ health and wellness. This item is also a flexible hose that we can use in our garden and other purposes. One reason is that it is made from high quality materials that make it long lasting and suitable for many uses. We can also use it in our boats and campers with ease and convenience. The item also has an ample size of 0.5 inch, which ensures high water pressure without us having to spend so much time in filling our water tank. Plus, this product has a 160-PSI working water pressure. We also love that the maker included a 10-year warranty on this product, as it can sure give us peace of mind in our purchase. We also believe that it’s a marker that the manufacturer trusts its product’s quality. One downside we found is that it tends to kink during first use. 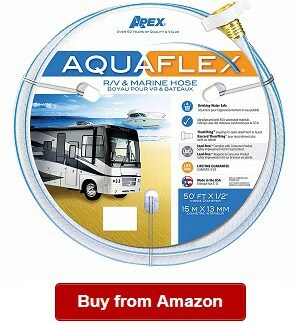 This AquaFlex marine or RV hose is one of the best around because it is compliant with most laws and standard for consumer safety. It is lead-free and passes the Consumer Product Improvement Act. We’re recommending this product because it has the ideal dimensions of 5/8″ x 25 feet to ensure flexibility and convenience. It can also ensure safe drinking water without the taste of chemicals and plastic all the time because it is made from safe materials that are also lead-free. This product is also made with the consumers in mind. It guarantees no kinking and twisting because of its reflex mesh patented technology. Using it, you don’t have to worry about dealing with these common complaints of many consumers because they have been addressed by the manufacturer. You can also conveniently attach it to the faucet and have peace of mind that water won’t leak. It is designed and made with standard and unique coupling for ease of use and guaranteed water savings. More on safety and quality, the product is made from FDA sanctioned materials, ensuring that we’re going to achieve peace of mind by choosing this Teknor Apex 8503-25. With such compliance to product standards, we can also look forward to long-term use of this drinking water hose. We can also flexibly use it for other purposes, such as in gardens and boats. We have one problem with it though. It can be slightly stiff during first time of use. If you’re looking for a frustration-free experience when using a drinking water hose for your recreational vehicle, then you might want to give this item a second look. The marine boat and RV water hose is a high quality and durable product that we’re proud to recommend to you, our fellow RVers. The manufacturer, which is also known for making durable potable water hoses, ensures our convenience for designing and manufacturing this product that guarantees no coiling and stiffness. We love it because it won’t give us a hard time to use in whenever we want. No scuffs are also guaranteed using this water hose. It can also be used as a washdown hose, which gives us more flexibility to use it in many applications. Another thing we love about it is its special fabric material that can prevent scuffing in our vehicle. This item also comes with high quality and standard brass fittings, guaranteeing no leaks and cracks. As they are made with brass, we can also worry not about rusting of our hose. It also means that we don’t have to replace these fittings from time to time. 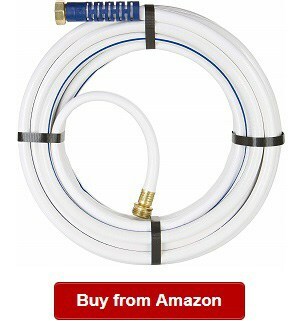 This RV Water Hose can also expand by up to 25 feet but still be able to provide with good water pressure. When dormant, we can keep it easily because it measures only eight foot dormant. It is also one of the most flexible products we have found around and very maneuverable at that. This time around, we don’t have to deal with stiffness anymore. We also recommend it because it is space saving and ideal for use in places where space is a premium. It can also be used in mobile homes, kayaks and boats. One problem though is that it is slightly heavier than other hoses on the market are. The 25-feet Camco heated RV water hose is a multipurpose and safe drinking water hose that is used by many people worldwide for its quality and durability. As it can be used with heated water, we don’t have to deal with cold water again when we need to shower or take a bath in the cold season. It is also a certified safe hose because it is made free from phthalate, lead and BPA, ensuring our family’s safety when camping and traveling in our motorhome or recreational vehicle. This is one of the things that can give us that ultimate enjoyment when we’re camping with our loved ones. It can also ensure that we don’t have to worry that our loved ones will have stomachache and other digestive problems while we’re away from home. This product also comes with an energy saving thermostat, which ensures of efficient function and our utility savings. It works by heating only when needed, giving us that peace of mind. The Camco TASTEPure also ensures that harmful chemicals or contaminants won’t leech into our water. 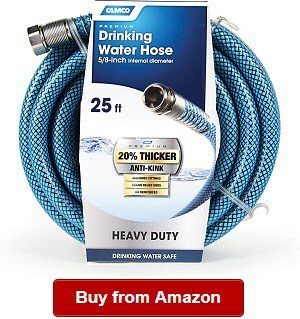 It won’t also make our water tasting like plastic, and that’s another reason we recommend this hose to you. The better than standard hoses Camco item can be used for a wide range of purposes including on agriculture, livestock, commercial, industrial and residential. The machined fittings also ensure a leak-free use and corrosion-free product. We love its heavy-duty jacket that can protect the electrical components and the hose from exposure or damage. One downside we found is that this item is a bit heavier versus other same category products are. This 1/2″ x 10 feet drinking hose is one of our favorites on this list because it provides enough pressure to fill in the water tank fast and effortlessly. It can also be used in multiple purposes, including on boats and kayaks. You won’t have a hard time using it because it won’t twist and kink, two of the most common complaints of users. The manufacturer is able to solve it because they made sure that the materials used in the product is not the same as used in ordinary hoses on the market. You can also be sure that your family will drink safe drinking water because this item is made of non-toxic materials, which comply with consumer protection laws and standards set by authorities. In fact, the materials used here are approved by the FDA themselves. It only means that buying the right RV water hose can give us that peace of mind we’re looking for when buying this kind of product. When it comes to water pressure, this one is also our favorite because it can provide 160 PSI of working pressure. With that said, we can be certain that we can fill up our water tanks without spending so much time in the process. The high water pressure is also made possible with the 0.5 inch of diameter of this hose. When it comes to strength, the Valterra hose can withstand up to 340 pounds burst of pressure. We love this hose overall for this amazing features and characteristics. One downside we found on this product is that it is a bit heavier than other options on the market are. 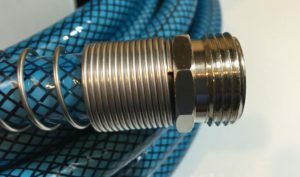 If you’re looking for an ideal marine or RV hose, you might want to consider this Legacy Manufacturing hose, which is versatile and flexible for many uses. It is perfect for boats, kayaks and RV camping. This drinking water hose is made of safe and authority-approved materials, which can stand the test of time and provide safe drinking water all the time. 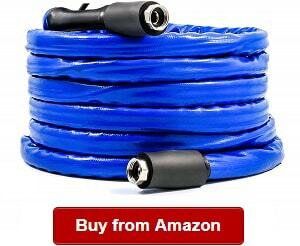 The hose is also super flexible, which is why it is one of our top picks among all the other products on the market. We recommend this drinking water hose because it can also handle and deal with the cold weather of up to 140 Degrees Fahrenheit. Hybrid polymer outer material makes this product more durable than other choices on the market. With that said, we find it a great value for our money. Using it, we don’t have to worry about the elements no matter how strong they are. We tested this product and noted how it won’t kink or twist even under great pressure. In fact, it has coils that can easily lay flat and with zero memory. We find that so cool. Just like what we found in many RV drinking water hose reviews, this Legacy Manufacturing hose is very helpful especially for its female swivel grip connection. What it does? It makes connecting easy and fast to a spigot or any other types of attachments. This product is also made with lead-free materials, making it safe for drinking water. One problem we have with the SmartFlex is that it can be stiff during the first uses. The Spring Hose is perfect for all types of outdoor adventures because it is easy to use and flexible. We find it valuable for our money because it is sturdy yet made with drinking water safe materials. This item does not contain lead and certified compliant with strict rules and laws. It is also smart for its recoil memory, and that is one thing we love about this hose. It has the ability of extending and retracting to its normal and original form after use. There is no need to do it manually because the hose can do it automatically. The manufacturer has also ensured convenience of use for it max flow fittings. Did you know that these fittings were also anti-salt water? This benefit makes the hose more durable no matter the harsh elements it meets outdoors. These fittings won’t also rust, meaning we can use it for a long time without worrying about that issue. We can also have peace of mind of superior water flow for its extra wide diameter that can withstand and deal with high-pressure water flow. Its construction can also resist the sun’s harsh UV rays and can prevent kink damage. The hose also can prevent overstretching. Our team also recommends it because it is extra long for multiple purposes. This item measures 50 feet, and that’s something we don’t find in other products in the same category. One downside is that it can be slightly heavy for small users. 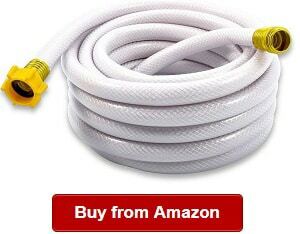 This hose is one of the best Swan Products that we found on the market. It is easy and convenient to use and can help us fill the water tank easily and quickly without spending so much time in the process. What makes it possible is that this product is rated and tested to deal with high pressure. The Element ELMRV12050 is also perfect for many types of outdoor activities, including boating, camping and other outdoor adventures. As outdoor enthusiasts ourselves, we find this versatile characteristic very useful. It is why we decided to include it on our list of the best RV hoses for drinking water. The marine hose is also made with hose armor, one of the things we love about it. It works by preventing the kinking of the hose to the attachment like a spigot, giving us an easier time of using it at marina or the campsite. This item is also perfect for any conditions without us worrying about damaging it in the process because of its solid and sturdy materials. Plus, with its length, we’re sure you will love how it can reach places. Unlike other drinking water hoses on the market, this one has a PSI rating of 300, making it ideal for high water pressure. We love that about the item that we are sure you will love, too. One thing we could note on its downside is that it can be a little bit pricey than other hoses are. 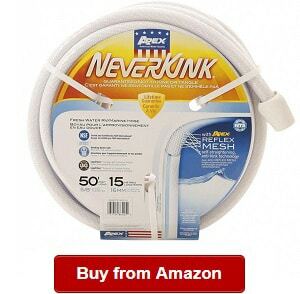 Writing this review of the best drinking water hose for RV, we believe that we must include this NeverKink water hose because it is durable and high quality. It is also long enough at 25 feet and its diameter is wide enough at 5/8 inch for high water pressure. We also love to recommend this product to you because of its no kinking, no tangling and no twisting use. What makes this possible is its NTS reflex mesh that can eliminate those issues. 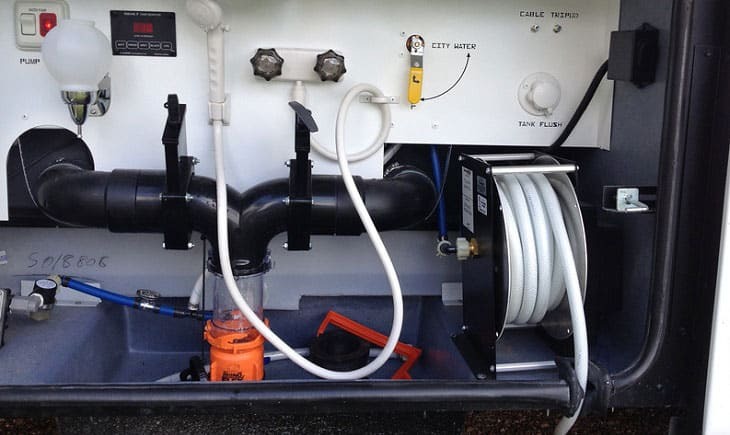 This is one of the best technologies we found around for drinking water hoses for RVs. We are sure you will also find it useful. When looking for an RV hose, we think that such technology can provide us with ease of use and convenience. That is why we would like to recommend this item to you if you’re looking for a multipurpose hose. The item is also made with FDA-sanctioned materials, ensuring it is compliant with the law and strict standards of the authorities. It is also safe to use for drinking water, so you don’t have to worry about the health and safety of your loved ones. The marine hose is also made with Grip-Tite coupling, making it easy for us to use it. This feature ensures of a leak-free operation when it is attached to a spigot or any attachment types. One problem we noted is that it’s a bit stiff during the first uses. 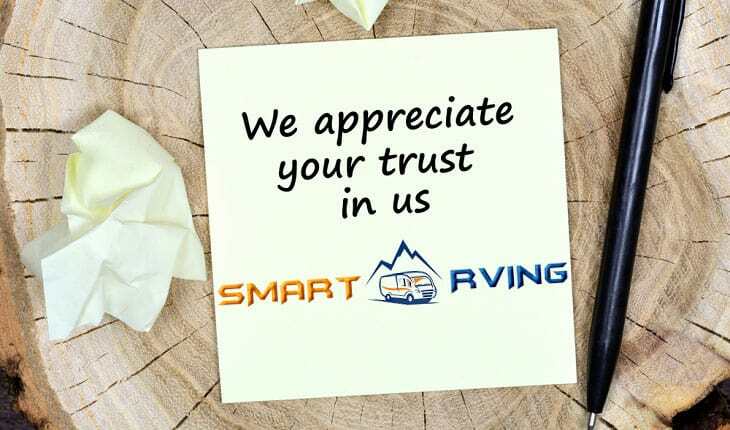 Trust our team when looking for the best RV water hose because we’re real RVers who have firsthand experience in using different water hoses, appliances and gears for our recreational vehicles. 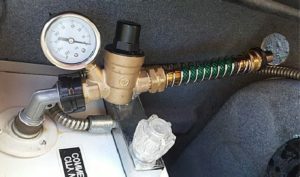 You must trust us because we also closely looked into the most essential factors when picking an RV hose just like when picking a water filter for your RV. By trusting us, you can rest assured that we’ve only included the most reliable picks on the market now. They are top-rated and well-reviewed products by RV owners themselves. They’re also durable, high quality and top performing. 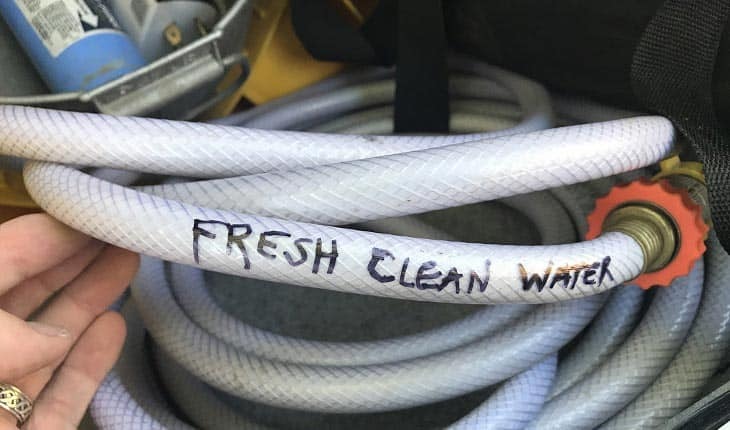 If you’re looking to find the right water hose for your vehicle, you might want to begin comparing the top products we’ve featured in today’s reviews. This RV water hose is made with lead-free, BPA-free and phthalate-free materials, ensuring that the hose is safe to use for drinking water when we’re RVing. Many of these recreational vehicle hoses are made with materials certified safe by the authorities. Most are also made with FDA-sanctioned materials, ensuring that they’re safe for drinking water. In short, these hoses comply with the strict rules and laws, especially on the Consumer Product Safety Improvement Act. 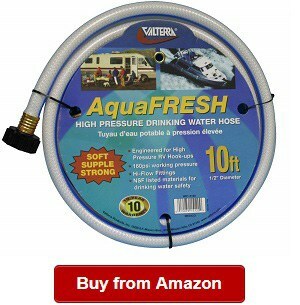 A drinking water hose for the RV is available in many lengths. As a standard, the best ones are longer at 50 feet long, making them ideal for many uses and purposes. They also work great under most conditions and elements. The best ones are also made of high strength materials to withstand the cold or harsh UV rays. Some of the latest models also have recoil memory, making storage fast and quick. The RV water hose works in a straightforward manner just like those we use in our gardens, in washing our car or doing the laundry. At the very least, it works through connecting it to a spigot. Also, it has two ends, which are threaded in a specific manner. One of the ends has a cuff that fits over the spigot’s threading, allowing for tightness’ adjustment for better and firmer hold. The other end usually has the hose’s opposite threading that allows at least one accessory or another hose to be attached or connected to the hose. The hose also has a fiber or rubbed included in the design so that the hose can have strong hold in the pressure it handles every time the faucet is turned on if the hose’s other end has a sealed valve in its design. There are many kinds of RV water hoses to choose from, which is why we would like to share the following for a guide on the type that you might find online and other sources. Each hose has a specific characteristic that makes them ideal for several uses. This RV hose is for drinking water, keeping drinking water safe from outer contaminants and elements that might pollute the drinking water. Just like other hoses, many are made with durable and high quality materials that you can rely on for long lasting use. Such a hose is also certified safe for drinking water. This water hose is specially made for the heated water purpose. Just as other types of RV hoses, this hose is made from high quality materials and FDA-sanctioned materials. This RV water hose is made especially for potable water. It is used for purposes, such as washing your boat, vehicle and other purposes. This hose is also made of lead-free, BPA-free and phthalate-free materials. This water hose can withstand low water temperature and the cold weather. Most good models are tangle-free and kink-free for convenient use. This type can ensure that your hose will be free from twisting, tangling and kinking, a few of the most common concerns of RV hose users. You need an RV water hose for plenty of reasons. Just like our home water hose, it works to help us experience the convenience in performing our tasks that require using water. The best of them offer durability because they’re made of high quality materials that can ensure long lasting use. They can give us more value of our investment, as they can deliver not only top performance but also lasting use. 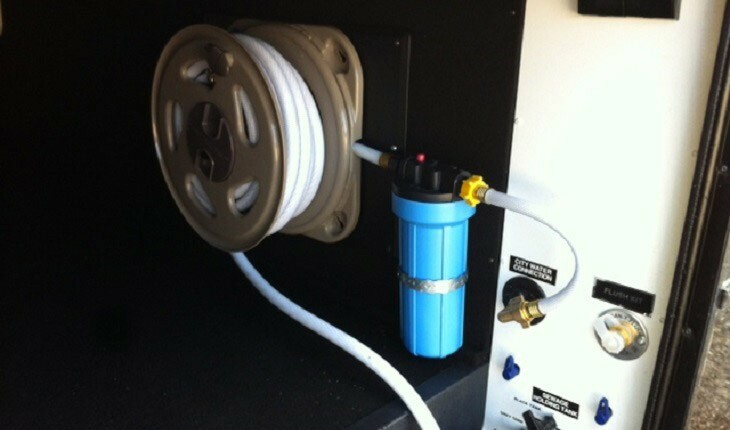 Using an RV water hose, we can also finish our tasks faster and easier than without it. This hose can eliminate the need for a pail, too. It does save us the time and effort. 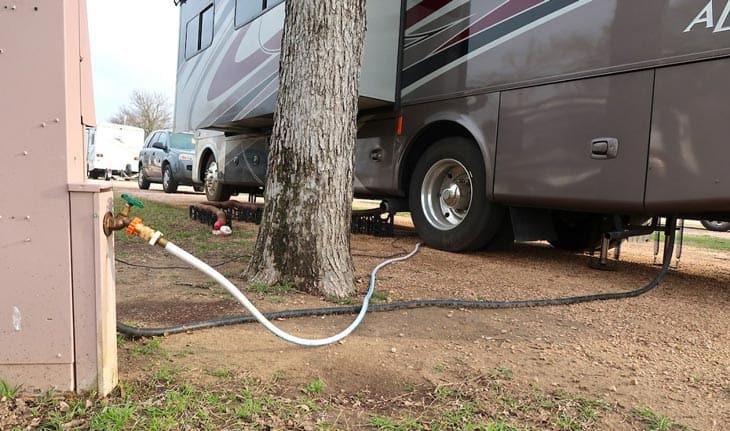 Definitely, there are many benefits of using an RV water hose. You should get one for your RV. But then, also consider several factors including its price, quality and durability to ensure of long lasting use. When looking for an RV water hose, there are certain factors to consider so that you can find the best one among the long list of choices to find online. In the following, let us take a look at some pointers to consider when shopping around for the right RV hose for you. What is the type of hose you want to buy? Is it for potable water? Is it for heated water? You must consider the type of hose, just like the Camco drinking water hose if you’re looking for a drinking water hose that can keep drinking water safe from contaminants, dust and other debris that might get into the drinking water. You should avoid an ordinary garden hose if you’re looking to buy a recreational vehicle hose, which is specifically made for outdoor activities, such as camping. For one, you can also opt for a heated water hose that can be a great choice if you are camping in a place where there is always freezing temperature. You might also find the no-kink water hose useful because it is made of reinforced rubber that can be effective against tangles and kinking. 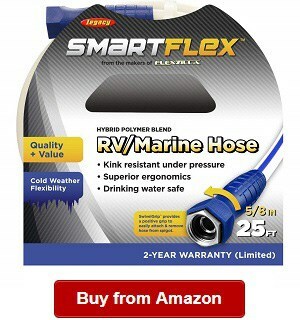 This is the ideal option if you don’t want your RV hose to kink constantly, which will shorten its service. How long is the RV water hose? You should look for a longer one to ensure that it can be flexible to use for many purposes. Some types include those at 6, 12, 25 and 50 feet. A longer one is a good choice especially if you cannot figure out how long is the water source from your RV. With the right length, it can be connected conveniently to the water supply source without straining the RV hose entirely. Get one that is easy to store. The best ones also have the recoil memory, which makes storage a breeze. Remember that you need to store the hose properly if you want to keep it in good working condition. Also, those that can be coiled easily can be stored in a secure and neat manner. To protect it further, you should keep it in an area away from harmful and harsh elements. If you’re looking for a drinking water hose, make sure that it is made of lead-free, phthalate-free and BPA-free materials. Check that the hose you’re looking to buy is truly safe for drinking water. You can be sure of it if the materials used are approved by the FDA and compliant with the laws. Don’t buy a hose that is inflexible if you don’t want to feel the stress due to having a hard time in maneuvering and using it. 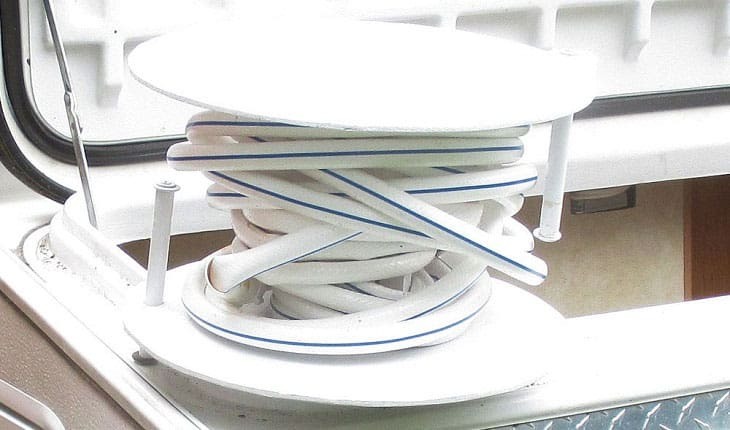 With a flexible hose, you can also be sure that it will be easy to store. Just like buying anything for your RV, you should be able to determine the price range of the hose you’re looking to buy. It will help in narrowing down your choices; thus, you can also save time in the process. However, do not consider only the price when buying an RV hose, but ensure that it is also made from high quality materials. But nevertheless, narrowing down your price choices will help you pick the right hose with the quality you’re expecting to get from the purchase. This is one of the most important factors to consider when buying an RV hose. We don’t want to spend so much time in dealing with these problems. That is why it might be better to look for hoses, which materials can guarantee no-kink use. Do not settle for anything less, but make sure you’re getting the most bang of your dollars. Choose a product that has certified safe materials, just as we said earlier. Make sure that the fittings and couplings of the hose you’re buying can provide you with a leak-free use. 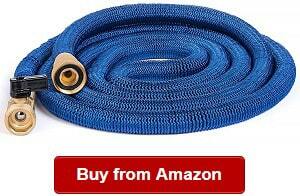 It is another feature to look for when buying an RV hose. You should not buy one that has poor and low quality fittings. The fittings should also be corrosion-free to ensure that your hose won’t have any rust in your hose. Check that the hose you’re buying has a wide enough diameter to ensure that it can withstand high pressure. Most good models have a diameter of 5/8 inch. There you have certain things to consider when buying an RV hose, whether or not you’re getting a flat RV water hose for your vehicle. Check on the factors, including the price, type, diameter, length, safety, government-approved materials, among other things we have mentioned above when shopping for a new drinking water hose for your recreational vehicle. Keep these things in mind so that you will be able to pick the right one for your needs. You might also want to refer to our list above for cool choices on the best water hose for RV. Q: Drinking water hose vs. garden hose: which is better for you? A: For your recreational vehicle, it is better to choose a drinking water hose, not an ordinary hose. It is to make sure that the hose is safe for drinking water and that it is especially made for RVs. Q: Can RV water hose be used with hot water? A: Yes, but you have to remember that there are specific RV hoses for that purpose. For help, you should choose one that is specifically made for heated water. Get started with the list above when choosing a heated water hose. Q: Are RV hoses lead, BPA-free, safe? A: Yes, they are lead-free and BPA-free, ensuring that they’re ideal and safe for drinking water. It is also the reason we are recommending buying an RV hose instead of a garden hose to guarantee this feature. Q: How long should RV water hoses be? A: They are available at different lengths: 6, 12, 25 and 50. If you’re looking for a more versatile option, then you might want to select one that has a longer length. Q: How to keep RV water hoses from freezing? A: There are specific tips and steps on how to keep it from freezing. You can find useful sources online to help you with it. In general, you can use foam pipe and heat tape to wrap around the hose to keep it from freezing. For the most part, you might want to check the manual of instructions for specific maker directions on how to keep yours from freezing. For the best results, you might want to choose a hose specifically engineered and made to withstand the cold weather. Q: How to clean RV water hoses? A: Generally, you should empty the hose to clean it up. Make water and bleach mixture to clean the inside of the hose. Run it inside the hose to clean the hose and rinse with clean water. But for specific cleaning instructions, refer to the manual. 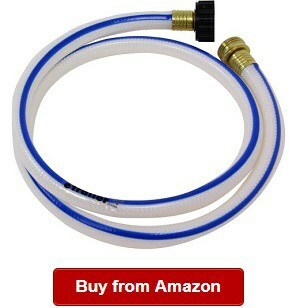 A: You can buy an RV water hose from different sources, including Walmart, Lowes, Home Depot and Amazon. But for a wider range of options, we recommend choosing and buying one from Amazon. There you have what to know when buying an RV hose for your recreational vehicle, boat or kayak, among other vehicles. 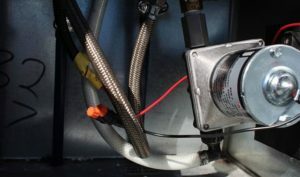 We’re hoping you picked useful information on this drinking water and heated RV water hose reviews so that you can make the right decision on which RV hose. To start in the selection process, refer to our list for the best RV water hose today! 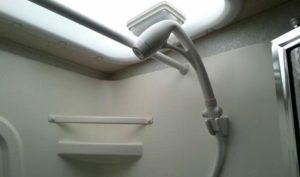 If you are looking for other RV freshwater system products, you should read these articles: best RV shower heads, best RV water filters, best RV water pressure regulators, best RV tankless water heaters, best RV water pumps and best RV water softeners. We do hope you like them. Thanks!